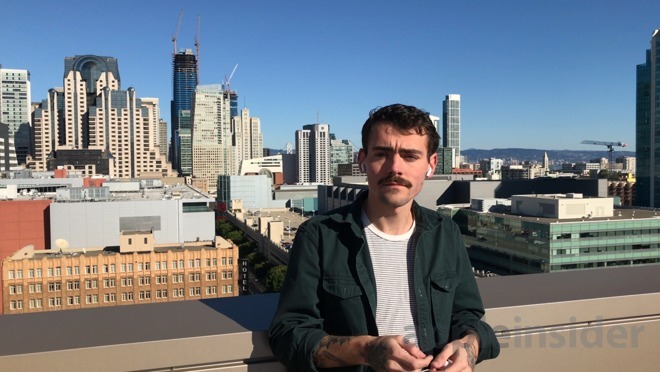 Walking down the street with AirPods in, a smile consistently crept across my face. Not having wires is a bigger deal than I'd imagined. It's the same feeling I got from an iPod back in the day: having a personal soundtrack that begs you to dance at least a little bit while you're walking. Without wires, the small, light AirPods don't have anything to tug or tangle, allowing you to forget you're even wearing them. They feel like a plugged-in enhancement that becomes part of your body itself, like effortlessly riding down a mountain on a snowboard or flying down a newly paved highway on a motorcycle, where you only occasionally need to make an intuitive gesture to maintain your superhuman experience. AirPods are a perfect example of micro-sized computers acting as Steve Jobs' bicycle of the mind: an efficient, immersive tool for extending the human experience using state of the art silicon logic packaged within an ergonomic design. My experience with AirPods immediately transported me back in time to the first iPod I bought myself: a feeling of sheer joy, effectively disrupting an otherwise rough patch of struggling through some dark clouds of depression. There's something very emotive and powerful about music, and no company has better capitalized on the prime property at the corner of technology and the liberal arts better than Apple. Across years of iPods and the parallel development of iTunes and Voice Over navigation for accessibility, followed by iOS devices that maintained and expanded the role of music and audio playback while introducing voice assistance with Siri, Apple has capitalized on delivering and reproducing music, and has loudly made music a regular feature of its advertising. While delayed by a couple months (as Apple apparently struggled with some mass manufacturing issues) AirPods bring a clearly needed delightful distraction to the tail end of the miserable year of 2016. In more general terms, the timing of AirPods' release is also strategic: Apple's flagship iPhone 7 stripped away its analog headphone jack, making AirPods the perfect way to springboard into the future without adapters or even wires at all. The Lightning EarPods Apple now bundles with iPhone 7 models won't work with Macs. But using Bluetooth and some iCloud-enhanced special sauce, AirPods can jump from your Mac to your iOS 10 mobile devices to your Apple Watch, seamlessly and frustration-free. AirPods sound great, building upon Apple's experience in enhancing its iPod and iPhone-bundled earbuds from initially being minimally adequate to sounding quite impressive for their compact, light profile with the release of 2012's EarPods. There are some basic constraints of physics that limit how "audiophile" tiny earbuds can be, particularly in contrast to full-ear headphones or fully unconstrained studio speakers. For typical users, AirPods should be impressively adequate in sound quality. 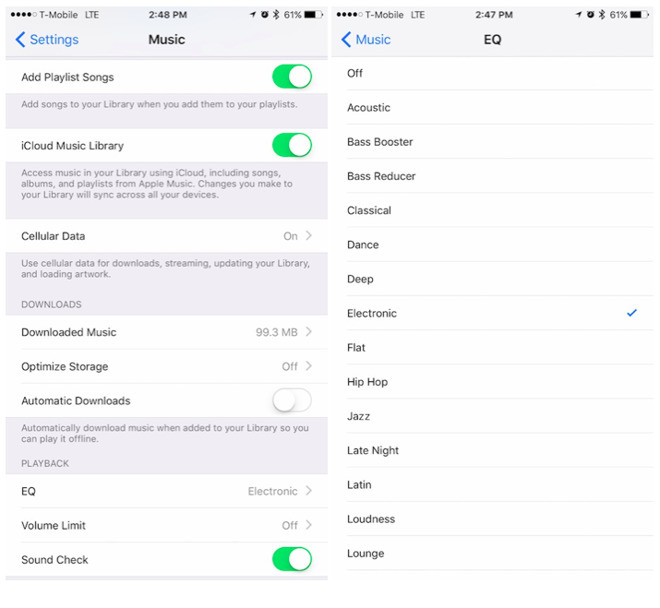 Depending on what you're listening to, it may improve things significantly to adjust your EQ settings. Oddly enough, there's no EQ settings or even bass or treble controls in the basic Music panel of Control Center (below) that appears when you flick up and over in iOS 10. It only presents basic playback controls, volume and an audio output selector. 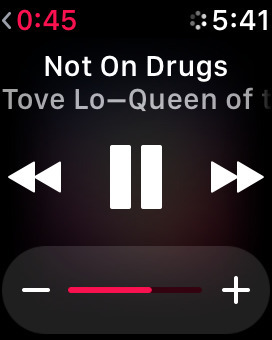 Apple loves simplicity, but it'd be nice to see (or even have the option to add) EQ controls in Control Center, rather than having to dig into Settings/Music (below). These settings are buried deeply enough that many users likely don't even know they exist. Given what Apple has been doing with the "True Tone" adaptive display on iPad Pro (and previous automatic brightness ambient adjustment on MacBooks), it would be even more clever to have automatic EQ enhancement as an option for adjusting the playback of different kinds of music (or spoken word) based on the content type. Automatic ambient audio levels would also be cool, allowing you to maintain a consistent relative volume that adjusts with the loudness of sound in your environment. Another feature the first version of AirPods lack is noise cancelation, although it's also useful that AirPods allow you to hear enough of the outside world to be able to hold a conversation without having to take them out (or even turn them off, if the volume is set lower.). In their current design, AirPods' sound quality does benefit from EQ settings and you can manually raise or lower the sound, but this requires manually adjusting things on your Mac, iPhone or Apple Watch, or alternatively using Siri (an experience we describe in more detail below). AirPods' snug, precise fit results in an ideal design for a virtually invisible wireless wearable that not only plays back sound but can also enable you to speak on the phone, dictate text and even listen for voice commands. Historically, Apple does well in replacing existing gadgets with a computer. Think of AirPods as a Bluetooth headset crossed with stereo headphones, a mic and teathered to the 64-bit supercomputer in your pocket that runs apps that integrate into Apple's Siri cloud services platform. 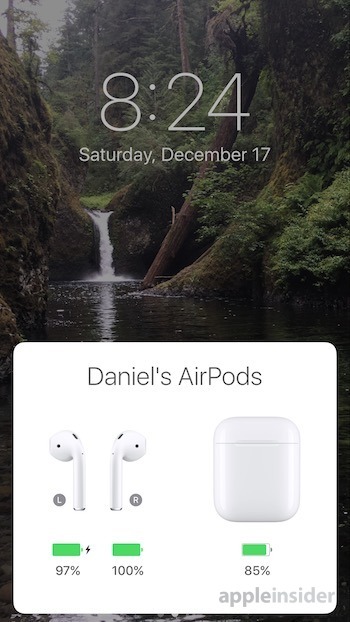 Without Siri, you can configure your AirPods to start and stop playback using tap gestures, as is the case when used as a basic Bluetooth device with an Android phone, for example. With Siri activated (as it is by default), you can tap to invoke the familiar sound effect that signals that you can ask for something: the next song, a change in volume, or any of the other things Siri is good at: weather, sports, taking notes, checking your calendar, getting directions to a nearby Thai restaurant, hailing a ride-share and so on. For basic audio control tasks, Siri feels like a little too much. 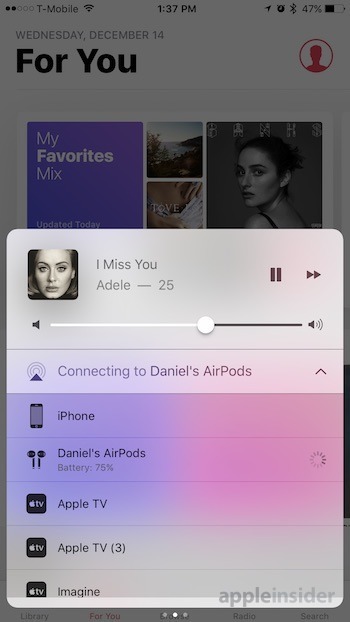 Skipping the current song (for example) involves a moment to activate Siri over your Bluetooth connection, then the hesitation of Internet interpretation via the cloud. That's notably slower than the old fashioned push buttons integrated into the cable of EarPods. 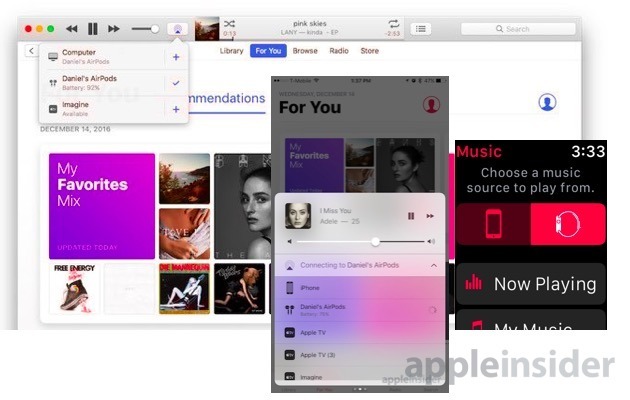 However, having Siri available and ready to answer anything also enables an expanded range of sophisticated interactions; you can tell Apple Music that you "don't like this song" to shape your future recommendations, and you can ask to listen to a specific genre, artist, song, podcast or whatever else you want. Siri still plays an inconsistent role as an assistant, ranging from brilliant to annoyingly obtuse at times. However, the impressive hardware Apple has delivered for AirPods means that every incremental enhancement the company can make to Siri will expansively add value to the new product. AirPods' sophisticated listening skills--a product of their beam forming microphones--also further open up natural cases for invoking Siri, which feel more natural than talking into your phone or watch. The new product effectively brings Siri's CarPlay experience to pedestrians, runners, and others operating outside of a car. There's room for improvement. It'd be nice if Siri could handle a subset of common tasks on local devices, particularly for music and volume controls that beg for a faster response than an iCloud roundtrip can logistically accommodate. More sophisticated touch controls would also be nice, so you could slide a finger to adjust the volume, for example. However, adding another sensor would also drive up the price and complexity of the product. If Siri can maintain incremental progress, AirPods' voice commands may help trend users toward more common use of Siri as a service even as it becomes more useful and reliable. In addition to their ability to reproduce audio and listen to what you're saying, the other quality bar AirPods seem to valiantly leap is wireless connectivity. Interruptions in Bluetooth signals can cause dropouts, pauses or even full disconnections, again a simple matter of physics in the bandwidth and battery constrained world of Bluetooth Low Energy. In typical use though, I found AirPods rarely experienced dropouts. When they did occur they were so brief, minor and infrequent enough to be readily ignorable. The occasional Bluetooth blip-out is 2016's version of TV static while making popcorn in the 1980s or a CD skipping in the 1990s: that inevitable consequence of a technology captive to real world physics, where you can improve things by simply shifting your behavior slightly. You can make AirPods' music blip out more frequently if you put your iPhone in your pocket covered by your hand. It's apparently the same signal attenuation issue that caused dropped calls for iPhone 4, back when Jobs was taken to task for explaining, "you're holding it wrong." But that remains true today: if you want to stream flawless audio between your iPhone and your AirPods, don't obstruct the signal with the radio-absorbing, meaty digits at the end of your arm. 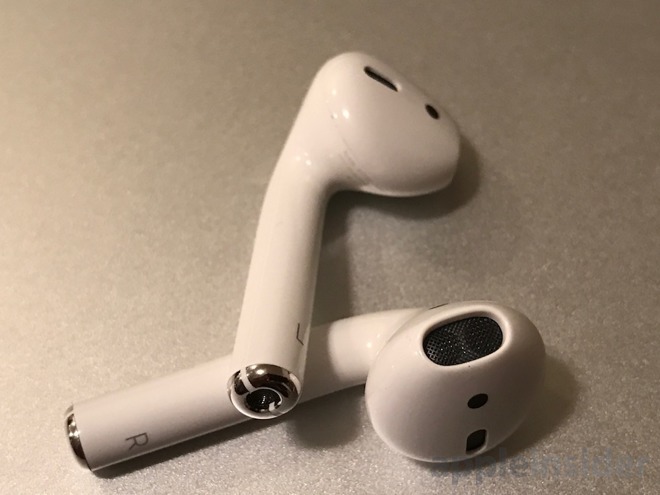 Having well-fit AirPods in your ears untethered by conventional wires tugging them down--or snagging on environmental hazards threatening to pull them out--means you can easily get lost in a cocoon of sound. AirPods as so small and light that they seem to dissipate away while you wear them, leaving you enveloped in sound without any strings. And despite all the concern trolls, keeping them in is not really an issue. 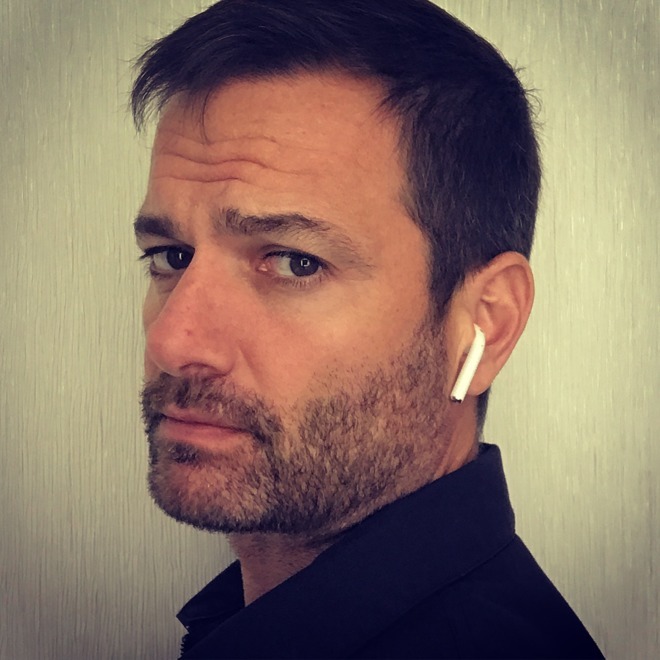 Of course, there is a fringe of the bell curve that AirPods may not work for: if you have an unusual ear shape or otherwise don't work well with existing earbuds, AirPods might not work for you either. 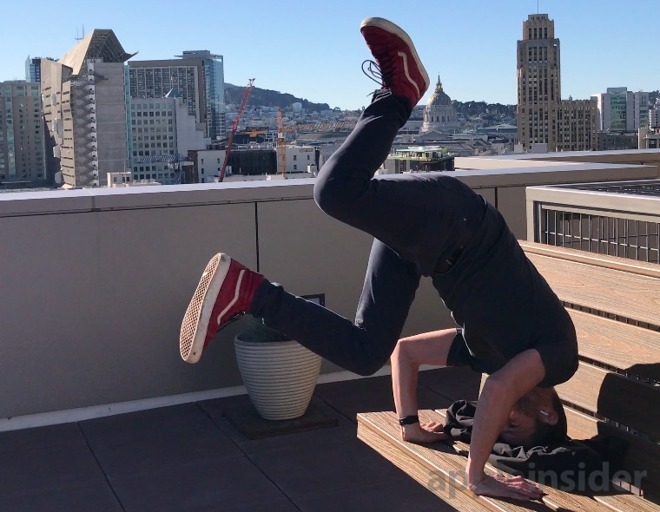 For me (and a dozen of my friends I had try them), the fit is secure enough to keep them from easily falling out when you quickly turn your head, dance, run, or even--as we tested over a series of video takes--if you flip upside-down. Keys and coins came out of my pockets easier. Across a half dozen heels-over-head flips, AirPods didn't budge. 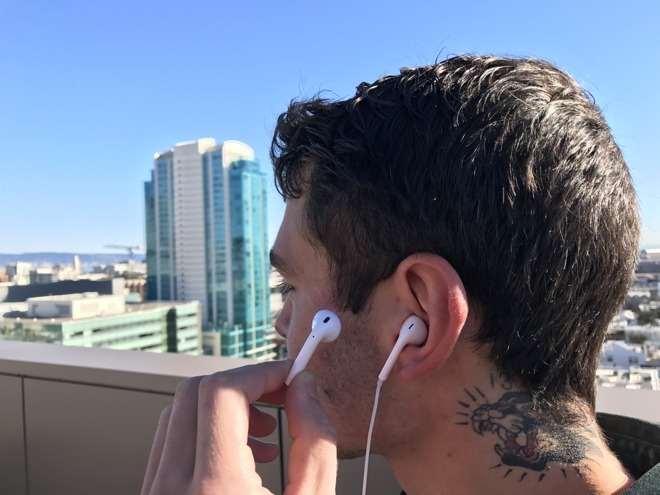 The only thing that seemed to risk displacement of AirPods is if you distort your ear canal by pushing up at the bottom of your ears, such as by resting your jawline on the palms of your hands with your fingers poking up at your ears. If you do this, however, you can feel the earbuds being pushed out before they loosen enough to actually fall out. Compared to Apple's wired EarPods, AirPods seem to fit more precisely at a roughly 45 degree angle, which also serves to point their microphones right at your mouth. Making AirPods responsive, invisibly light, sounding great and lasting a long time on a charge is, all together, a challenging task, particularly at an attractive entry price for wireless headphones. Apple has targeted the engineering issues involved by leveraging all of its know-how in custom silicon. It developed its own specialized W1 chip to perfectly balance power consumption with high quality performance and reliability. The result is really impressive battery life without compromising audio while dramatically improving connectivity performance. This is a key example of Apple acquiring and developing a core technology that makes its products demonstratively better than rivals'. Note that the W1 chip magic is also used by Apple's Beats subsidiary, resulting in impressive performance there, too. AirPods last for a long time —easily playing for a five hour stretch--before needing a recharge. And the tiny earbuds charge rapidly, reaching 100 percent in what appeared to be less than half an hour. During that time, you can listen to one in mono while the other charges, allowing you to extend your wireless listening time using the charging case with its integrated battery. I ran one earbud dead while the other reached 10 percent. While listening to the last tenth of the battery on the left earbud, the right one charged up fully, placed in the case for less than a half hour. The earbuds fit into the charging case with a slight magnetic pull, so they won't come flying out as soon as you open up it up. The case also features a hinge with a satisfying click that securely shuts and doesn't pop open in your pocket. The case's round edges also mean you can throw in in your pocket with your phone and it won't scratch it up. Note that while in the charger (and even after being charged up) the earbuds seem to still incrementally drain the case battery. The case itself charges using a Lightning cable (there's one included, but no wall power adapter) so anywhere you can charge your iPhone you can also top off your AirPods. The case and the earbuds make such good use of their small batteries that they're both really quick to recharge. Of course, if you have a newer MacBook model you'll need a USB-C adapter or Lightning cable to charge the case directly from your Mac, just as with an iOS device. There's not too much to learn about using AirPods. The case they come in features a simple button on the back for manually connecting to basic Bluetooth devices (such as an Android phone), and also features an indicator light on the inside that shows whether the earbuds are actively charging or not. The earbuds themselves don't have any buttons, apart from an accelerometer-based tap control for invoking Siri. Open the case up for the first time and they offer to connect to your iPhone. Pop them in and they start working. Take one out and playback pauses. Reinsert and it resumes, or you can tap to restart playback. Take one out and you can tap the other to resume playback in mono. It all seems designed to "just work," right out of the box. If you've accepted a phone call, taking one earbud out doesn't kill the call; it continues in mono. Replace the other earbud and the call continues. Once the call ends, music playback resumes in stereo. Every aspect of how AirPods work is delightful. This is some masterful engineering work. The transition from listening to music to accepting an incoming call (which you similarly can answer with a tap gesture) is effortless, and the audio quality AirPods offer on the phone is great. As soon as your call ends, the music starts again. That's one of the things that made me feel like I was walking into the future with a big smile on my face--it's a great feeling. More than just wireless earbuds, Apple's tightly integrated AirPods expand the company's sophistication and lead in wearables, with a practical, powerful pair of tiny technology "pods" that bring a new joy to music listening on a level reminiscent of the original iPod.